As part of the development of the County Road 44 multi-use pathway, two pedestrian crossovers have been installed. The crossovers are located in front of the Municipal Centre (285 County Road 44) and the Fire Station (259 County Road 44). These crossovers are new the Municipality and in an effort to educate both pedestrians and drivers on their safe and proper use, the Municipality has created an infographic shown here or on the Municipality’s social media channels (Twitter & Facebook). Copies can also be picked from the Municipal office. The information also outlines the fines and penalties for misuse of the crossovers. The North Grenville community is invited to enjoy the opening with demonstrations, games and treats. Please save the date for the Official Opening of the County Road 44 Multi-Use Pathway and Pedestrian Crossover! A short ceremony with ribbon cutting and media photo will take place at 12:15 p.m. on the west side of the Urbandale Arts Centre. In attendance will be Mayor Gordon, members of the North Grenville Municipal Council, Ontario Provincial Police, members of the Active Transportation Advisory Committee and Municipal staff involved. 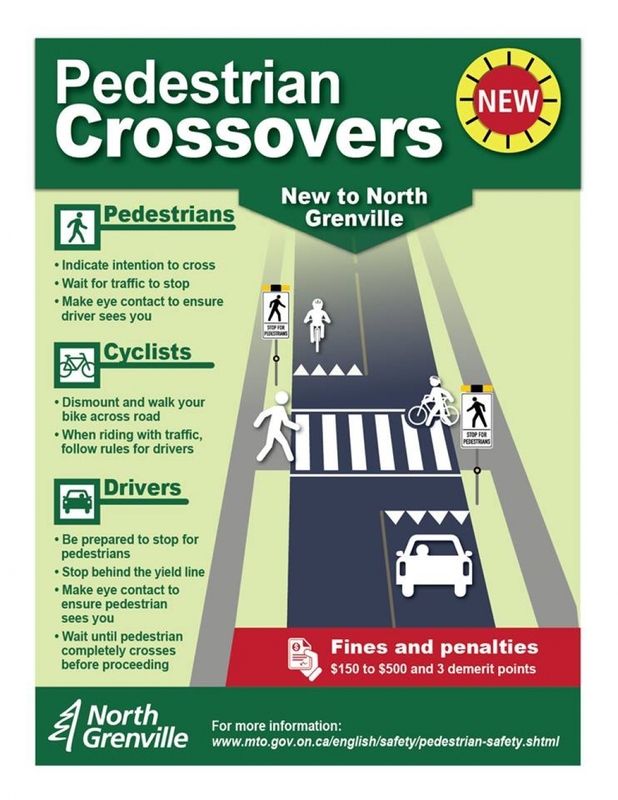 We would like to provide the community with an opportunity to be educated on guidelines for use of the pedestrian crossover.